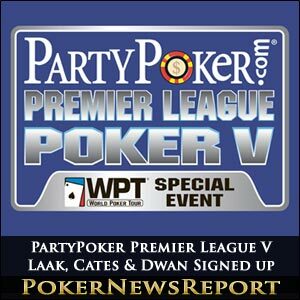 The line-up for the PartyPoker.com Premier League Poker V just keeps getting better and better with Phil ‘The Unabomber’ Laak, Daniel ‘Jungleman’ Cates and Tom ‘durrrr’ Dwan the latest trio of big-name pros to sign up for the $125,000 buy-in tournament. The latest staging of this fabulous event, which will run from April 4 to 10 in Vienna’s Montesino, really is a who’s who of poker pros as the stellar line-up already includes Finnish star Patrik Antonius – a one-time European Poker Tour (EPT) champion – English duo Luke ‘FullFlush’ Schwartz and Sam Trickett, Lithuanian Team Party Poker Pro Tony G, American Team PokerStars Pro Vanessa Selbst and American Andy Frankenberger – who won last November’s $25,000 Premier League Poker Mixed Game Championship in London. The 16-player, Matchroom Sport-produced event – which will be presented by Team Party Poker Pro Kara Scott – is scheduled to run before the PartyPoker.com-sponsored World Poker Tour (WPT) Vienna €3,500 buy-in main event takes place from April 10 to 15, while the Party Poker Big Game VI gets underway on April 11 for a 48-hour tournament. It’s certainly going to be a thrilling few weeks in Austria, with one-time World Series of Poker (WSOP) bracelet winner Laak – who was born in Dublin but raised in San Francisco – already gearing himself up for the three-tournament schedule. The 39-year-old spoke to the PartyPoker Blog about next month’s intense schedule, saying: “The Big Game, Premier League, and a WPT event all in one place and all at one time. Vienna here we come. 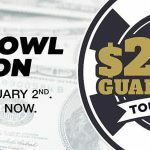 Well, Phil, it’s just got a lot more difficult to win any of these three tournaments following the announcement that, as well as Laak himself, 25-year-old New Jersey native Dwan – who is an online specialist in highest-stakes No-Limit Texas Hold’em and Pot-Limit Omaha – and 22-year-old Cates, who bagged more than $5 million in prize money in 2010 as the year’s top internet earner, have added their names to the list of star players making the journey to mainland Europe. 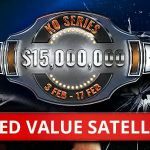 A press release from PartyPoker Premier League V provided details of the event, stating that the tournament is structured to “feature 16 players split up into two groups of eight in the main event, each competing in four league matches showcasing the famous point system ($2,000 per point)”. The release continued by informing interested players and fans that “the top three from each group will automatically go through to the final table, while the fourth and fifth seeds will square off in a series of heads-up matches (best of three) for spots in the eight-handed finale”. The eventual winner of the WPT’s “special event” will walk away with a $25,500 WPT World Championship seat for the May 19 to 26 tournament at The Bellagio in Las Vegas, while an additional $200,000 has been added to the $2 million prize pool for the final table in Vienna. Poker fans in Britain will be the first to see highlights from the event as Sky Sports have taken up the rights to show four hours from each heat, while there will also be international distribution so coverage should reach millions of homes across the globe. Additionally, the two-day Big Game VI – which takes place during the WPT Vienna main event – will also be televised. Now, if you fancy a crack at the pros in Premier League V, nine qualifying round places are up for grabs at Party Poker via six weekly satellites, daily qualifiers and freerolls that are already up and running at the online poker room. But you had better hurry if you are hoping to emulate Juha Helppi, JC Tran, Andy Black and David Benyamine – the four previous Premier League champions – as there is a midnight, March 18 deadline. However, the fortunate winners will be awarded $13,000 packages for the Premier League V qualifiers that include a $10,450 seat at the televised play-off, four nights at a lavish hotel and $1,350 to spend.